Hey Gang Some Crazy racing coming up soon at Perris, see if you can make the Hell on Wheels weekend as they have a 1/4 Dirt track, if you saw my website carpyscaferacers.com or blog on here of the UK’s Dirtquake, this is the best event here in SoCal right now and very cool people. not sure if we will have a bike ready this year but want to attend to check it out as its a great venue. Now- NO front brake OK!!!!! You can run a rear- so if you are like me, and you want to have a go, get some practice in somewhere as its weird wit no front brake if you ride on the road all the time. We want to go up there and see whats going on, not sure if we shall have a bike done in time but will try, but this is a super Venue and I think it would be a great meet up for like minded people. So if you want to go and watch some fun racing, this is the perfect event to go watch, I am going to mention it to the Flying Burrito ” Gene Romero” As I am sure he would get a kick out of it. So- put this in your Calendar folks!!!!!! Check it out as its August 16th!!!!! Here is the info you need and the website below!!!!! Hell On Wheels Hot August Nights. 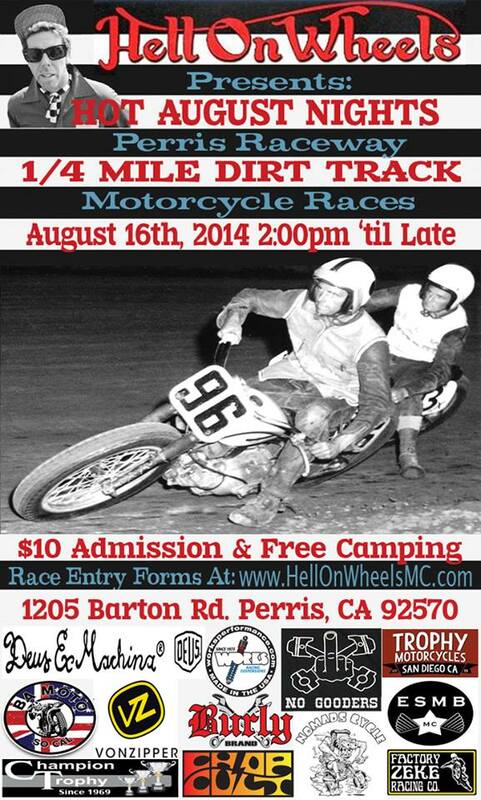 Our annual run what you brung flat track race will be held at Perris raceway on August 16th. Gates open at 2pm practice at 4pm. Race anything, classes for every bike, knobbies, street and flat track tire allowed. Mini bike…. Under 100cc and has to be a Mini meaning a 6 year old could ride it. East Side Moto Babes ladies only race. Pro class: Flat track bikes and riders who actually know what they’re doing. Early sign up is strongly recommended we filled every grid last year. $40 pre entry, $60 on the day, $10 admission.